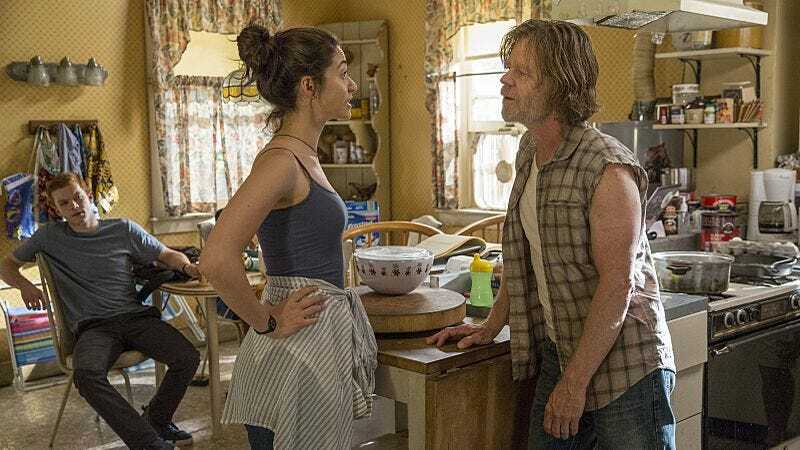 Showtime’s Shameless generally operates as an ensemble show, but one that nevertheless has a pretty clearly defined lead: Emmy Rossum’s Fiona, the forced matriarch of the reckless Gallagher brood. Despite her frequent failings, Fiona is the moral center of the show, working to keep her father Frank, played by Emmy winner William H. Macy, from fully pulling her siblings into his world of debauchery and low-rent con-man shenanigans. Now, Rossum is asking for financial recognition of her status as the show’s linchpin, with Variety reporting that the actress is currently renegotiating her contract for a salary equal to Macy’s—plus extra, in recognition of the many years during which she was paid considerably less than her male co-star. Rossum has reportedly been offered the same paycheck that Macy—who was the show’s biggest name by far back when it debuted back in 2011—is currently getting today, but is holding out for more, presumably as a way of addressing Hollywood’s long and much-discussed history of paying female performers less than men. Neither Showtime, nor Rossum’s representation, have commented on the story. According to an unnamed source quoted by Variety, though, Rossum’s negotiations are currently holding up renewal news for the show’s eighth season. The source also says producers are confident they’ll be able to bring the negotiations with Rossum to a satisfactory close, and have made it clear they have no plans to continue the series without her.